"Here's to our friends... and the strength to put up with them." 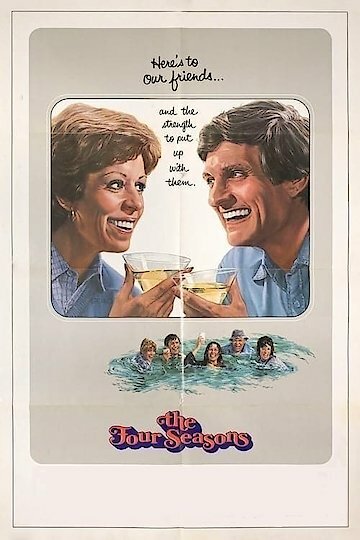 Alan Alda both directs and stars in The Four Seasons, a 1981 romantic comedy that delves into the effect of a mid-life crisis on a circle of old friends. Jack and Kate (Alda and comedienne Carol Burnett) have been married for years. They’re a successful and happy couple who work in the legal and publishing fields. They also regularly vacation with two other married couples, Nick and Anne (Len Cariou and Sandy Dennis) and Danny and Claudia (Jack Weston and Rita Moreno). The vacation routine is abruptly changed when Nick, an insurance salesman facing a mid-life crisis, decides to leave his wife Anne, who is struggling to become a photographer. He marries a younger woman named Ginny (Bess Armstrong) and tries to bring her into his old circle. The resulting comedy, and occasional moments of drama, come when the other couples at first resist this change to their years-long pattern of friendship, and when Nick’s newfound happiness with Ginny begins to call some of their own familiar and established relationship patterns into question. The Four Seasons is currently available to watch and stream, download on demand at Amazon Prime, Starz online.